The size of the neo-Nazi rally in Charlottesville, Virginia on Aug. 11-12 is not unprecedented in U.S. history — nor the terrorist attack out of character for white supremacists. 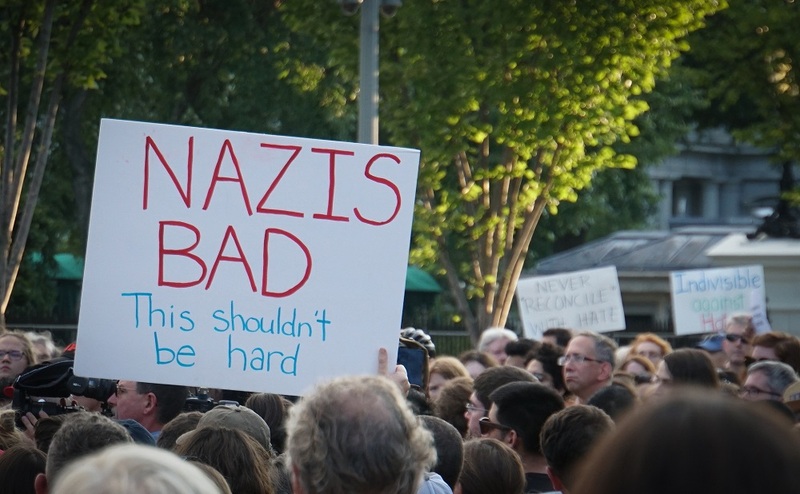 However, several trends and new methods of organization have contributed to the American neo-Nazi movement’s growth and increased willingness to mobilize openly. First, of course, is the increase in racist rhetoric in U.S. public discourse with the ascension of Donald Trump into the presidency, whom neo-Nazi groups have directly cited as helping grow their numbers. Secondly, white supremacists have built a loose, horizontally-distributed network — enabled by digital communications — across the United States and Canada. Akin to a budding insurgency, the Nazi groups remains ideologically flexible enough to accommodate some divergent views, while at the same time allowing large numbers of recruits to assemble in cities such as in Charlottesville. Distributed organization: The modern white supremacist movement organizes primarily online via web forums and newer websites such as Daily Stormer, TheRightStuff.biz and private, invite-only chat rooms. Meetups include dinner, workouts, “hate hikes” and attending gun ranges. The groups present at Charlottesville are geographically dispersed, with handfuls of members in individual cities, allowing them to mass hundreds of committed, armed followers given several months of planning. 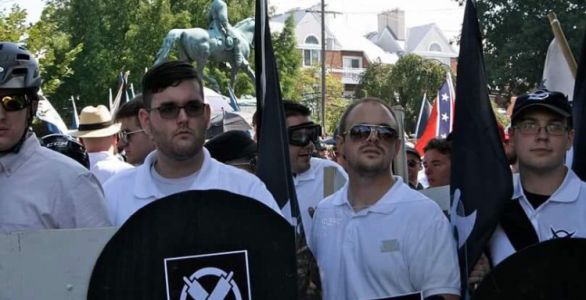 White supremacists can have overlapping memberships, with far-right groups playing on the names of regional sports teams while also participating in activities with national neo-Nazi organizations such as Vanguard America. 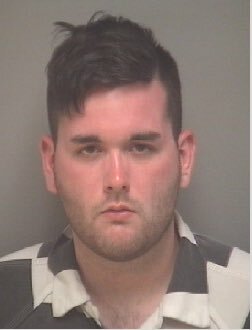 James Fields, alleged to have killed one person and injuring 14 others in a vehicular assault, was wearing the khaki pants and white polo shirt characteristic of Vanguard, and photographs show him at the rally holding a shield with the group’s logo. Two Virginia state troopers were killed in a helicopter crash the same day. While their numbers are small when isolated, these groups — as demonstrated in Charlottesville — can converge like a swarm on a single town in a frightening and intimidating display of power, overwhelming the capacity of law enforcement before dissipating or being driven out by the public. “They had better equipment than our State Police had,” Virginia Gov. Terry McAuliffe said, referring to armed militia members which had descended on the rally. Flexibility: While it’s too soon to tell how the aftermath of the Charlottesvile attack will affect the far right’s cohesiveness, the extreme right is if anything prone to infighting. This may become more acute after the rally, which was by all accounts a disaster for white supremacists. One advantage is that this model does allow for some ideological flexibility, and the lack of a single hierarchical organization with a single leader — in its place are many organizations with many leaders — means there is no single point of failure. This fate befell the National Alliance, which broke apart in the 2000s after the death of William Pierce, its leader and author of The Turner Diaries, which helped inspire Oklahoma City bomber Timothy McVeigh. 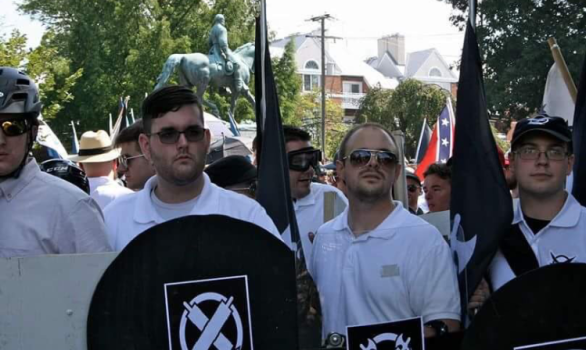 In addition to the neo-Confederate League of the South and Nazi groups such as Vanguard America and Identity Europa, the Charlottesville rally included Richard Spencer of the white nationalist National Policy Institute. Spencer has advocated for a softer line on gay men — a position which other far-right extremists have largely rejected. Nonetheless, Spencer being at odds with the bulk of the movement hasn’t interfered with him taking a leading role. Other advertised speakers included Tim Gionet, a former Buzzfeed social media strategist who radicalized into white nationalism and was injured at the rally, and Augustus Invictus, a former U.S. Senate primary candidate in Florida for the Libertarian Party and Thelemite who professed to sacrificing a goat and drinking its blood. The National Socialist Movement and Traditionalist Workers Party also have differences — the latter being more akin to the Strasserists — but both stood arm-in-arm at Charlottesville. These factors and a willingness among members to inflict terroristic violence bodes ill for the United States. What is encouraging is that the shock of the rally and the backlash to Fields’ attack will not do these groups many favors, due to not only increased law enforcement attention but further rallying by anti-fascist groups against them. It’s also possible these groups will bleed some newly-radicalized members who — under pressure or aghast at what they witnessed — choose to drift to other forms of right-wing politics. There are anecdotal comments on white nationalist forums that suggest this drift is already occurring. However, white supremacists’ eagerness to inflict violence is highly unlikely to disappear given its centrality to the ideology. As any would-be insurgency, it would behoove Americans to study how counter-insurgents have defeated terrorist movements and criminal gangs in other parts of the world. While the security services are responsible for investigating and prosecuting domestic terrorists, to unravel far-right extremists’ ability to organize requires broad coalitions of people rooted in local communities willing to stand together and oppose them.